We have seen Kumpulan Melaka Bhd commissioned its big solar farm quite recently at Melaka World Solar Valley and now Mudajaya - a construction company - has entered into this profitable but limited business of producing energy from solar. Mudajaya has commissioned a 10-MW solar farm in Gebeng, Pahang, and signed a renewable energy power purchase agreement with Tenaga Nasional Bhd for a concession period of 21 years. No qualms at all on big players getting the big chunk of the limited solar PV quota, but being one of the public contributors to the Renewable Energy fund (you pay 1.6% on top of your electricity bills nowadays), I am entitled to my opinion that many, not just few, companies and organisations should be given better opportunity to participate. 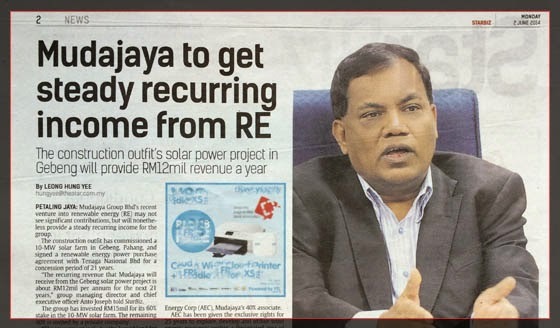 If SEDA allocate, say, 65 MW of solar PV quota for 2014 then if big conglomerates get 'allocated' for 5MW or 10MW then only few would benefit from the fund. And I thought all these companies would need to go through balloting process. Did Kumpulan Melaka and Mudajaya Group go through the lucky draw? Am I implying that some people negotiate to get quota rather than being lucky at the ballot box? No, but if there is one thing SEDA can do to eliminate doubts, it would be to periodically and frequently publish the on-goings at its office - e.g. Full report on applications, elimination process, eligible applicants, allocation register, list of companies and quota, etc. This would be on top of the updates it makes on its portal. Don't expect people to keep coming to the website to check for news; reach out to the public by going to the mainstream media, newsletter, emails, etc. These people are your financiers! Renewable Energy initiative should be an effort to first make the people aware by getting as many organisations as possible to participate. Thereafter, you can embark on capacity. This may take longer to achieve the capacity target, but if your RE fund size is only that big then that's the pace you have to make do with.